Where states offer it, winter squirrel hunting is a nice way to unwind. It allows you to continue your year spent outdoors right into the next one. However, hunting these bushy tailed animals during the harsh winter months is tough. Squirrels seem to be everywhere during the early season, as food supplies are much more abundant, squirrels are less wary, and leafy branches restrict the game's vision, allowing for closer, easier stalks. Nevertheless, that does not mean you should overlook late seasons squirrel hunting. And after all, what hunter doesn’t want a little challenge? To start off, hunting squirrels is a great reason to keep your skill sharp all year round. And not to mention, it is a great introductory game to hunt if you have 1) never hunted or 2) are a young hunter. Hunting squirrel can teach gun safety, marksmanship, field-to-table information, and even still-hunting techniques. With the vast numbers of squirrels available in their desired areas, they are they perfect “go-to” game to hunt. To add onto the great skills you will learn as a hunter out in the field, you can also learn great skills at home while cleaning and cooking this game. Many hunters have the misconception that this game is hard to clean, due to the fact that they are so small, however, that is just another myth that has grown too popular over the years. Real Tree provide’s a great 2 minute tutorial of how to clean squirrel, click here to watch it. Now that you know a few reason as to why we believe this game to be so beneficial to hunt, here are 4 tips and strategies to be more successful during your hunt. During the winter season, the foods squirrels ate during the early part of the season are mostly on the ground, or gone for that matter. Therefore, it's a good idea to try finding trees that have held their acorns longer. Consider targeting pin oaks as they hold their mast a little longer than white oaks. This will likely allow you to draw a lot of squirrels up into their branches where they're easier to spot. Squirrel hunting is the perfect time to work on your still-hunting techniques. Still-hunting allows you to see a lot more squirrels, as stalking fiercely through the woods can sometimes scare them out. These quick animals need to be sneaked up on in the most cautious way, and still-hunting can be a technique used to help you fill the bag. At this point in the season, the coverage of the area you have been hunting during the fall has vastly changed. Leaves have fallen, trees may have been knocked down, and overall, your visibility has improved, yet so has the squirrels. Therefore, make sure you are wearing the proper camouflage for your region, ensuring that you are blending in with the area you are working with. 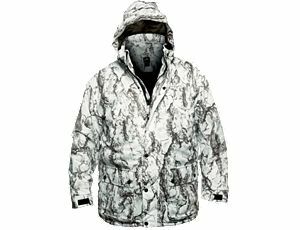 Cabela’s offers great camo that is going to keep you warm, covered, and improve your odds of success. Click here to start shopping within your HuntWise app today, where you can shop from all of the latest and best brands. As we stated above, the land you typically hunt during the fall and spring is going to vastly differ during the winter season. Therefore, choose what land you are hunting wisely based upon the conditions you are going to hunt in. Try scouting your land before you decide to hunt. This is going to reveal to you areas of interest and help you better strategize how to approach the hunt. Use your HuntWise app to mark areas of interest, as this will help make the entry and exit of your hunt a breeze, helping you easily locate those areas of interest. For example, if you have a choice between hunting a ridge and a creek bottom, stick to the creek bottom. The leaves will be wetter and the going quieter. You'll also be keeping a lower profile so squirrels won't be as likely to spot you. Also, hunt mountains or hilly areas when wind conditions are unfavorable if your land allows you to do so. This often reveals hollows where calmer conditions prevail and squirrels are more active. Overall, we want to see you have a successful hunting season and keep your skills sharp for the more popular hunting season such as turkey and whitetail. And not only will squirrel hunting keep your skills sharp, but it can also keep that freezer full when the venison seems to keep disappearing. Therefore, take these skills into consideration, and prepare for your hunt. With these tools, you are sure to see success. Good luck hunters, and shoot straight.